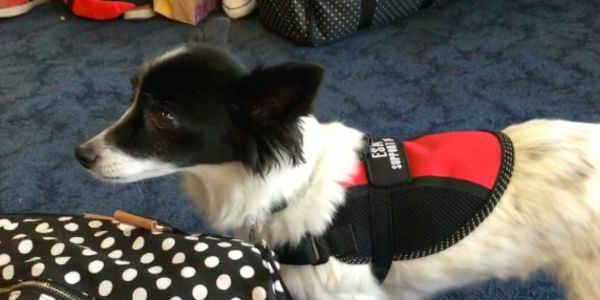 petition: Airlines want to make it harder for people to travel with emotional support animals! Protect ESAs! Airlines want to make it harder for people to travel with emotional support animals! Protect ESAs! I used to take medication daily to help curb my anxiety until I adopted my dog. Bowie is more than a four-legged friend he has helped me to get off medication and live a fuller, more complete life. Although he is not classified as one, he is my emotional support animal (ESA). Traveling can be stressful for many people and emotional support animals can provide the traveler with physical and psychological support needed to make the journey. But after a woman famously tried to take a pet peacock on a flight, Delta Airlines and other airlines are tightening the requirements and making it harder for pasangers to fly with their pets. Delta and United Airlines announced that, effective March 1, 2018, they will place new restrictions on emotional-support animals and may require documentation of each animal's health and training. Delta will require passengers seeking to fly with pets to present additional documents outlining passenger's need for the animal and proof of the animal's training and vaccinations, 48 hours prior to the scheduled flight. American Airlines is also reviewing its policies on support animals. DOT is expected to propose new rules to address support animals in July. Delta's new policy demands more than just a note from my doctor outlining my issue, it demands passengers present proof of the animal's training. But Emotional Support Animal certification training can cost thousands of dollars and is not actually required to become an ESA. Emotional Support Animals (ESA) are animals that provide therapeutic benefits to their owner through affection and companionship and according to the Official ESA Registration of America, they do not require specialized training. It is unacceptable for Delta and other airlines to arbitrarily decide that the classification of a emotional support animal is incorrect. Please sign my petition and ask the Deptartment of Transportation and FAA to clarify rules around flying with emotional support animals and don't allow airlines to make it harder to fly with needed compaionship.